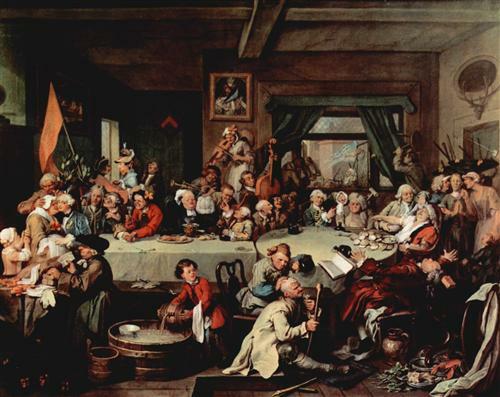 The Banquet, by William Hogarth, 1755 (image on Wikipaintings; painting at Sir John Soane’s Museum, London, UK). If discretion, as Falstaff frankly noted, is the better part of valour in field battle, perception might be said to be the better part of substance here in the conference proceedings at Planet Under Pressure (PUP), now moving into its third day in London. Another, less obvious, shift in perception is manifest here, as noted by Cheryl Palm, senior research scientist in the Tropical Agriculture and Rural Environment Program of the Earth Institute, at Columbia University, and Thomas Rosswall, chair of the steering committee of the CGIAR Research Program on Climate Change, Agriculture and Food Security (CCAFS). Palm and Rosswall, attending a conference launch last night (27 Mar 2012) of a new CGIAR Research Program on Water, Land and Ecosystems, remarked that this was the first event of its kind that they could remember to which agricultural scientists had been invited. The road from Rio in 1992 to Rio is 2012 has indeed been a long one for agricultural scientists, who until now have been largely excluded from fora where august bodies have deliberated on global change, the Earth system and its planetary boundaries. Even here, a full two decades after the first United Nations Earth Summit and with widespread recognition that agriculture (cast recently here and elsewhere mostly in terms of ‘food security’) is—and has always been—a main driver of change on our planet, agricultural researchers still comprise perhaps less than 10 per cent of the 3,000 or so PUP delegates. Among the examples of failed collective action repeatedly being cited in discussions here, such as that between science and policy, surely a glaring if unspoken one has been that agriculture until now has been missing from the global change table. Most of the food-related scientists here are members of the CGIAR, the world’s largest consortium of agricultural researchers, now entering its sixth decade. Some 10,000 CGIAR scientists, technical staff, students and support staff work in extensive partnerships in developing countries to boost food production and improve livelihoods of the poor while also protecting their environments. For these under-represented agriculturalists, with their many neglected passions—whether plantains, roots and tubers; or small-scale rain-fed farming systems; pastoral herders and mixed crop-and-livestock farmers; Kenyan dairy women; Rwandan bean farmers; the millet-growers of the Sahel; the wheat farmers of South Asia; the rice growers of Southeast Asia; or informal market food sellers everywhere, . . .)—a tipping point here may be the passing of an era of a kind of ‘agricultural exceptionalism’. With their voices now being heard for the first time among the many other kinds of scientists working for global public goods, these agricultural researchers have great expectations of how much agriculture can, working with the socio-economic, environmental and other pillars of global sustainability, contribute to the ‘fundamental reform needed to create a genuinely sustainable society’ (Ostrom). Can we get ahead of the disaster? Can we develop novel governance structures? Will we do so in time? Will the newly connected wired world help us do that? On to the day’s break out sessions . 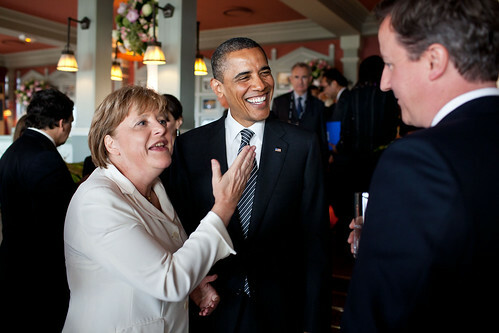 . .
German Chancellor Angela Merkel, who recently paid a visit to US President Barack Obama in Washington, DC, talks with the US president and British Prime Minister David Cameron before the start of the working G8 dinner in Deauville, France, 26 May 2011 (on Flickr by White House/Pete Souza). Chancellor Angela Merkel of the Federal Republic of Germany arrives tonight (Monday 11 July 2011) in Kenya’s capital, Nairobi. This is Ms Merkel’s second tour in Africa since she became chancellor in 2005. 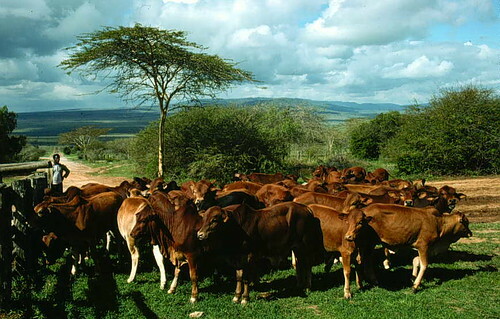 On Tuesday (12 July), Merkel will meet Kenya’s President Mwai Kibaki and Prime Minister Raila Odinga and pay visits to Nairobi University and the International Livestock Research Institute (ILRI), where German scientists have been working for decades on ways to use farm animals as instruments for poverty alleviation. As reported in Kenya’s Capital FM, ‘German ambassador Margit Hellwig-Boette said the Chancellor chose to make Kenya her first stop in her three-nation visit because of its strategic role in shaping the region’s political and economic stability. “The Chancellor’s visit is a sign of recognition in Kenya’s role on political and economic development in the region,” the ambassador said. . . .
‘Ms Merkel arrives in Nairobi on Monday night and will stay on until Tuesday evening when she departs for Angola, the second in her tour of three African nations. She will be in Nigeria on her third day. . . .
‘During her busy schedule on Tuesday, Ms Merkel will hold bilateral talks with the President and the Prime Minister separately and later hold a joint press conference with Mr Odinga before heading to a State luncheon hosted in her honour by President Kibaki. ‘Later on at 3 pm, she will issue a keynote address at the University of Nairobi’s Taifa Hall and later visit the International Livestock Research Institute (ILRI) before winding her visit with a visit to the UNEP [United Nations Environment Program] where she will hold round table discussions with experts there mainly on renewable energy where German[y] is a world leader. 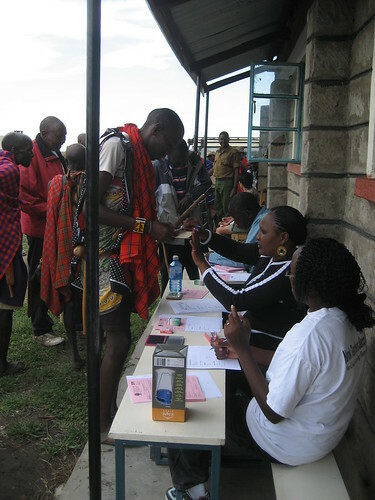 ILRI is a member of the Consortium of International Agricultural Research Centers. The Consortium works to reduce poverty and hunger, improve human health and nutrition, and enhance ecosystem resilience through high-quality international agricultural research, partnership and leadership. 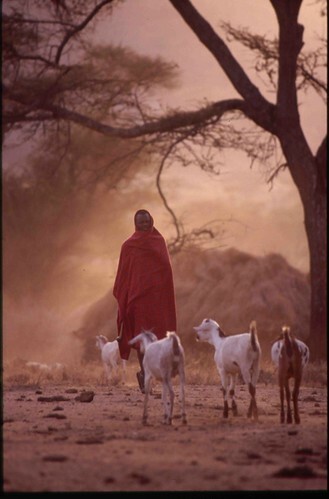 ILRI and 14 other centres that are members of the consortium operate in over 200 locations worldwide, and work with a network of thousands of partners at all levels and across all sectors involved with international agriculture, and increasingly natural resources and the environment. Read more at Kenya’s Capital FM: German Chancellor to visit Kenya, 10 July 2011. Today saw the publication of a special issue of Experimental Agriculture guest edited by Tilahun Amede, Shirley Tarawali and Don Peden. 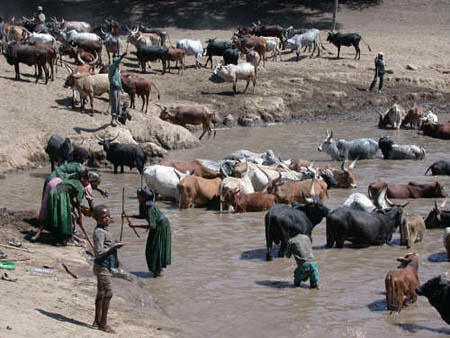 It presents evidence from Ethiopia, Zimbabwe and India, and captures current understanding of strategies to improve water productivity in drought-prone crop-livestock systems. 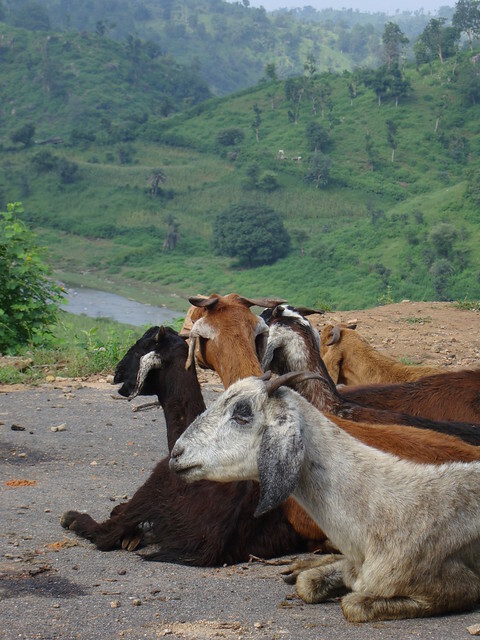 Crop-livestock systems in sub-Saharan Africa (SSA) are mostly rainfall-dependent and based on fragmented marginal lands that are vulnerable to soil erosion, drought and variable weather conditions. 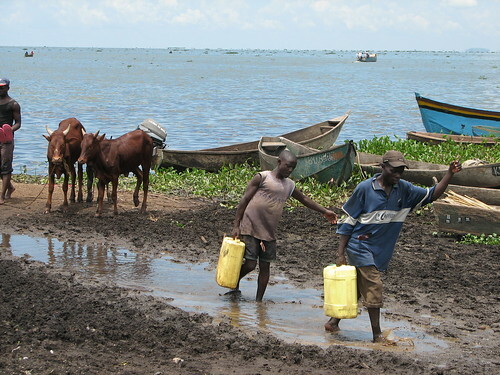 The threat of water scarcity in these systems is real, due to expanding demand for food and feed, climate variability and inappropriate land use. local, national and basin scales. 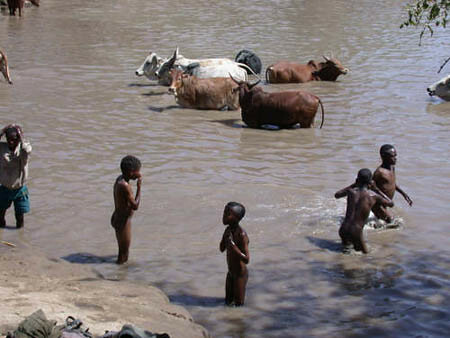 The spiral of watershed degradation causes decline in water budgets, decreases soil fertility and reduces farm incomes in SSA and reduces crop and livestock water productivity. In areas where irrigated agriculture is feasible, there is an increasing demand for water and competition among different users and uses. Strategies and policies to reduce rural poverty should not only target increasing food production but should also emphasize improving water productivity at farm, landscape, sub-basin and higher levels. In drought-prone rural areas, an increase of 1% in crop water productivity makes available at least an extra 24 litres of water a day per person. 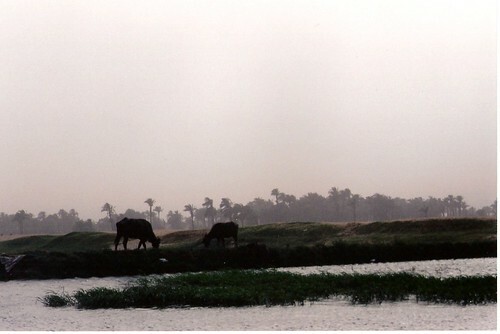 Moreover, farming systems with efficient use of water resources are commonly responsive to external and internal drivers of change. A recent article in the Economist, 'The miracle of the cerrado [savanna],' is still stirring up passions. 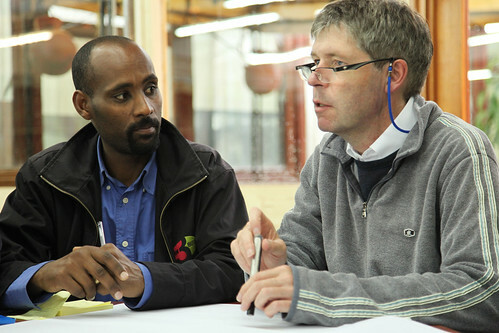 Some, like our colleague Tom Tomich, formerly at the World Agroforestry Centre (ICRAF), in Nairobi and now at the Agricultural Sustainability Institute at the University of California at Davos, California, take issue with the idea that large farms are necessarily more efficient and productive than small ones. 'SIR – I believe you are correct to reject neo-Malthusian pessimism about 21st Century food prospects in your leader “How to feed the world: Brazil’s agricultural miracle” (28 Aug), but in the process, you ignore some of the most painful lessons of the 20th century and glibly advocate elements of agricultural strategy that long have been discredited as inappropriate for much of the world. True, the world does face food challenges in coming decades of similar magnitude to those tackled in the latter half of the 20th century. As you note, those successes came though a mix of scientific innovation, new inputs, and national policies that linked farmers with profitable market opportunities. (These innovations were adopted by many farmers, both small and large.) And Brazil’s Embrapa provides an apt example of the transformative power of public investment in agricultural science that should be emulated by more tropical countries; Brazil, to its credit, is striving to assist other countries in efforts to strengthen their agricultural R&D agencies. 'But you do a profound disservice to serious efforts to avert future food crises and the human misery these entail by extolling “capital intensive large farms” as the focus of agricultural development. 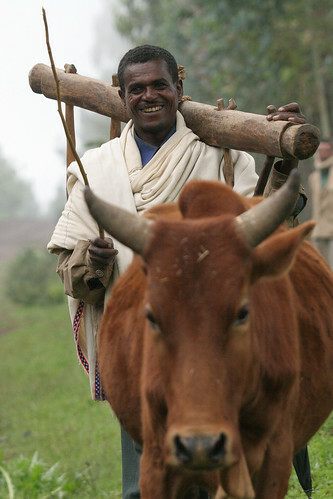 The scientific evidence refuting your approach under conditions prevailing across much of Asia and Africa has been available for decades: as long as rural wages are low (characteristic of countries with chronic mass hunger), broad-based agricultural development (involving the majority of farms, which are small) is more economically efficient, leads to higher productivity per hectare, and creates more rural jobs than your approach. 'Is there really no downside to Brazil’s agricultural miracle? 'It’s not easy to explain the Brazilian agricultural miracle to a lay audience in a couple of magazine pages, and The Economist makes a pretty good fist of it. It points out that the astonishing increase in crop and meat production in Brazil in the past ten to fifteen year — and it is astonishing, more that 300% by value — has come about due to an expansion in the amount of land under the plow, sure, but much more so due to an increase in productivity. It rightly heaps praise on Embrapa, Brazil’s agricultural research corporation, for devising a system that has made the cerrado, Brazil’s hitherto agronomically intractable savannah, so productive. 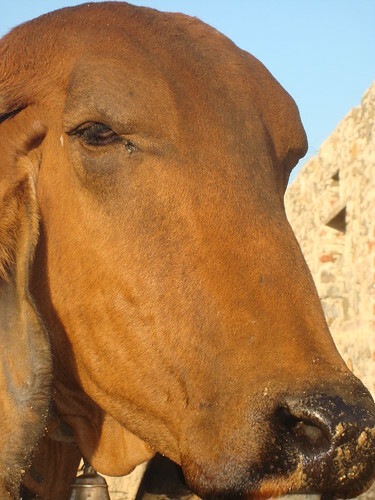 It highlights the fact that a key part of that system is improved germplasm — of Brachiaria, soybean, zebu cattle — originally from other parts of the world, incidentally helping make the case for international interdependence in genetic resources.1 And much more. 'What it resolutely does not do is give any sense of the cost of all this. I don’t mean the monetary cost, though it would have been nice for policy makers to be reminded that agricultural research does cost money, though the potential returns are great. The graph shows what’s been happening to Embrapa’s budget of late. A billion reais of agricultural research in 2006 bought 108 billion reais of crop production. 'But I was really thinking of environmental and social costs. The Economist article says that Brazil is “often accused of levelling the rainforest to create its farms, but hardly any of this new land lies in Amazonia; most is cerrado.” So that’s all right then. No problem at all if 50% of one of the world’s biodiversity hotspots has been destroyed.2 After all, it’s not the Amazon. A truly comprehensive overview of Brazil’s undoubted agricultural successes would surely cast at least a cursory look at the downside, if only to say that it’s all been worth it. Especially since plans are afoot to export the system to the African savannah. And it’s not as if the information is not out there. 'A final observation. One key point the article makes is that the success of the agricultural development model used in the cerrado is that farms are big. 'Like almost every large farming country, Brazil is divided between productive giant operations and inefficient hobby farms. Read more at the Economist: The miracle of the cerrado, 28 August 2010, or Agricultural biodiversity Blog.